We use only the most up to date environmentally friendly products and application techniques for your family's peace of mind. Environmentally friendly for your family, pets and gardens. 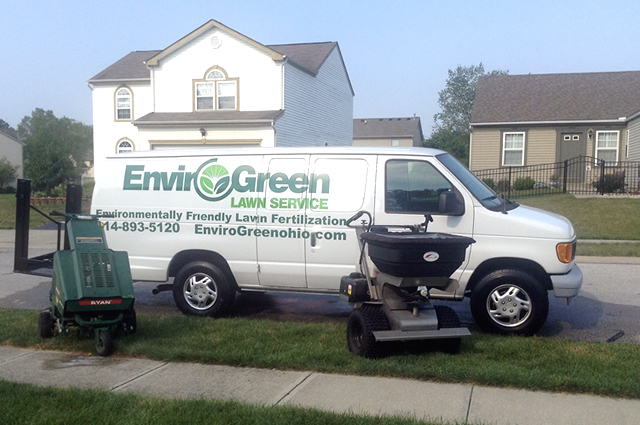 Evirongreen is a local lawn fertilization business serving Central Ohio and sorrounding areas. We believe in offering proven, green products for a healthy lawn and safe space for your family, pets and gardens. Licensed Specialists & Guaranteed results: All of our specialists have been trained and licensed. We back our services with a 100% Moneyback guarantee. Free Lawn Analysis / Best-fit Maintenance Programs: With each first-time visit, we will provide a no-cost lawn analysis as well as a tailored lawn program that fits your needs. Environmentally Friendly Pre-emergent & Target Weed Control: We only use the most up to date green products and application techniques for your family's peace of mind. 1st Application - Crabgrass control and specially formulated granular fertilizer - For your first visit, EnviroGreen will apply Granular fertilizer that promotes early green up along with crabgrass prevention and targeted weed control, getting your lawn off to a green start. A thorough inspection of your lawn will also be conducted to address any old or new concerns that need to be addressed. 2nd Application - Specially formulated granular fertilizer and targeted weed controls - This will promote a deeper green color and strengthen your root system, which only granular fertilizer can provide. A strong root system creates a thicker, healthier lawn that naturally defends against weeds and annual grasses. 3rd Application/Plus grub control - Specially formulated granular fertilizer and targeted weed controls - This will strengthen your lawn while controlling those pesky weeds. Only our specially formulated granular fertilizer gives you that month long slow release to strengthen your root system. A grub preventative treatment is applied at this time to ensure that white grubs do not devastate your lawn. (This is provided at an no additional charge). 4th Application - Specially formulated granular fertilizer, targeted weed control - During this mid-season specially formulated granular application, we evaluate your lawns specific needs; address any concerns at no expense to you. EnviroGreen's licensed specialists have you covered, letting you and your family enjoy your lush green lawn. 5th Application - Specially formulated fertilizers and targeted weed controls - Only our specially formulated granular slow release fertilizer will help your lawn recover from the stress of summer. Targeted weed control is also applied at no additional cost. Core aeration and over seeding are recommended and (included) for the first two years with (new customers). 6th Application - Specially formulated granular fertilizer - Prior to your lawn going into winter dormancy we will apply our specially formulated winter granular to help deep feed your root system for the long winter ahead. 1st Application - Insect and Disease Application - Our specially formulated Insect and Disease control application protects emerging leaves from damage caused by mites, insects and diseases. This is a critical time of year because insects are hatching and want to feed so they can reproduce again. 2nd Application - Insect and Disease Application - Our second specially formulated insect and disease control application protects midseason growth from insects that have several lifecycles during the growing season. Insect problems will be controlled for continued health, and green growth for your landscape plants. 3rd Application - Insect and Disease Application - Our third insect and disease control application gives late season plants protection from insects that emerge at this time of the growing season. Plants and ornamental trees need to be protected throughout the growing season for a healthier landscape. 4th Application - Insect and Disease Application - Our fourth insect and disease control application gives late season plants protection from insects that emerge at this time of the growing season. Plants and ornamental trees need to be protected throughout the growing season for a healthier landscape. 5th Application - Insect and Disease Application - Our fifth insect and disease control application gives late season plants protection from insects that emerge at this time of the growing season. Plants and ornamental trees need to be protected throughout the growing season for a healthier landscape. Flea and Tick Control: Having a lawn that's free of fleas and ticks is one of the best ways to live more life outside. But these pests can be more than just an annoyance. They can transmit diseases and cause allergic reactions in both people and pets. Envirogreen Lawn Pest Control shield can greatly reduce your exposure to fleas, ticks and pest-associated diseases. The Centers for Disease Control and Prevention suggests that you consider using a professional pesticide company to help reduce your exposure to these threats. That's why Envirogreen pest control shield is designed to help eliminate active fleas and ticks and combat new eggs as they continue to hatch. EnviroGreen offers superior services to maximize your lawns potential. They range from weed and pest control to core aeration. EnviroGreen Licensed Specialist-EnviroGreen state licensed specialist tailor's a lawn care plan to bring out your lawns potential. Healthy lawn analysis-EnviroGreen's 10 point analysis ensures your lawns specific needs. EnviroGreen Lawn Guarantee- If you don't love your lawn we'll make any necessary adjustments to ensure your satisfaction. EnviroGreen weed control- We use only the safest and most current weed control practices to ensure your weeds are eradicated and your family and pets are safe. EnviroGreen targeted weed control- We only target the specific weed so healthy grass isn't affected. EnviroGreen family friendly fertilization- We only use granular fertilizer to give a more even distribution throughout the month. Stays in place unlike liquid fertilizer, better for the environment and your family. EnviroGreen targeted insect control- EnviroGreen uses only the safest and most current insect control practices to ensure your insects are eradicated and safe for your family and pets. EnviroGreen soil amendment-We balance the soil ph to give your lawn optimal growth for nutrients, rooting and microorganism activity. EnviroGreen core aeration and over seeding- Opens compacted soil to allow water, air and nutrients. Fills in thinning areas of turf with new seed. © Copyright 2015-18. EnviroGreen, LLC.